After much anticipation and planning I hosted our inaugural Playgarden session yesterday. I was shocked and overjoyed at how many mothers were interested in joining us as of right now we have 8! I think due to the small spaces in my home, we are going to break off into two groups one that meets on Mondays and one that meets on Thursdays and then we will all gather to celebrate festivals together. I feel that our first meeting went really well, and all the kids had a wonderful time! We have little ones ranging from one to 7 so it was really nice to see how well they played together and how much the older children were willing to help the younger children, It was just like I have read about it so many books but it was really special to see it actually work. We meet outside for a little freeplay and to help the kids who traveled a bit to get back into their bodies, then we moved indoors for circle time. We did a few verses, stories, and finger plays, then the children broke off for some indoor freeplay while the Mama's Crafted window stars. These are my little ones washing dishes I actually did not take any pictures during Playgarden this week. Then we gathered for snack time, I had made some porridge and the kids used the "apple peeler corer" to peel apples an add to a nice fruit salad. We lit a candle and called the fire fairies, said a blessing then enjoyed our snack together. Once we were done we snuffed the candle, said goodbye to the fairy and the kids washed their dishes. Then we headed outside for a nature walk, a puppet story and our goodbye song. I am really excited to see the Playgarden take off, and I have such a lovely group of Mamas to work with, a few former Waldorf Teachers, a few very experienced Waldorf Mamas and a few very new to Waldorf Mamas, its a great mixture! 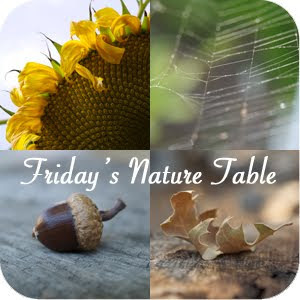 Shared on Waldorf Wednesdays at Our Seasons of Joy Blog and on the Magic Onion's Friday Nature Table. This looks like such a magical day! I keep wanting to start something like this here in our new home and just haven't had the courage yet. Thanks so much for linking up on Waldorf Wednesday. Hope to see you back soon!